For an overview of the whole programme of public events, please download Festival leaflet. We are delighted to be hosting two public lectures during the Festival. These will both take place in the Birmingham International Conference Centre (BICC). 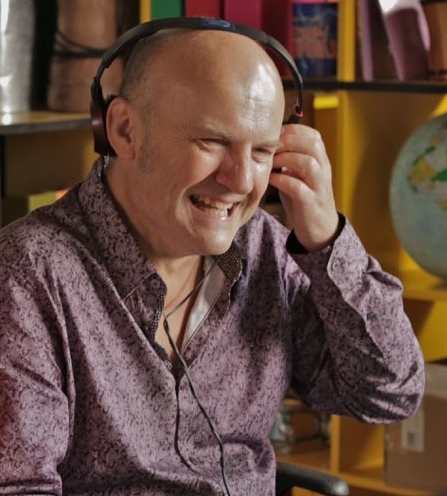 Professor Paul Howard-Jones is well known from the 'Secret Life of 4 ,5 and 6 year olds' documentaries, which give viewers an insight into the minds of children as they make their early forays in to the world and relationships around them. His day job is as Professor of Neuroscience and Education at the University of Bristol. His research explores the benefits offered to education by emerging technologies, aided by insight into the underlying cognitive processes. In his talk, Paul will discuss how and if we can apply our burgeoning understanding of how the brain learns to improve teaching and learning in the classroom This is a question increasingly asked by educators, scientists and policy-makers - and there is considerable debate about whether and how this might, or even should, happen. We warmly invite everyone with an interest in neuroscience, cognition, the brain and how it learns, to come and join us for this free public lecture. See full details and book your place online. As the age of the population increases, dementia is becoming increasingly frequent in western countries. Already there are more than 700,000 people with dementia in the UK and the number is likely to double in the next 30 years. Professor Clive Ballard leads a diverse programme of research, ranging from basic science and post-mortem studies to drug discovery and clinical trials, focussing on Alzheimer’s disease and non-Alzheimer dementias. Clive Ballard joined the University Exeter as executive Dean and pro vice chancellor on the 2nd November 2016. He was previously Professor of Age Related Disease and Director the Biomedical Research Unit for Dementia at the Institute of Psychiatry, Psychology and Neuroscience, King’s College London. He has published more than 500 peer review papers, including key meta-analyses systematic reviews and clinical trials published in New England Journal of Medicine, Lancet, Lancet Neurology, Nature and BMJ related to brain training, treatment of psychosis, agitation, depression and pain in neurodegenerative disease, dementia with Lewy bodies, vascular dementia and the treatment of dementia in people with Down syndrome. The Anne Silk Lecture is kindly supported by The Silk Trust, a charity founded in 2001 in memory of the late Frederick Silk. It is primarly engaged in supporting research and development in the fields of neuroscience, neurodegeneration and Motor Neuron Disease. Anne Silk, a retired clinician, will be attending the lecture herself. 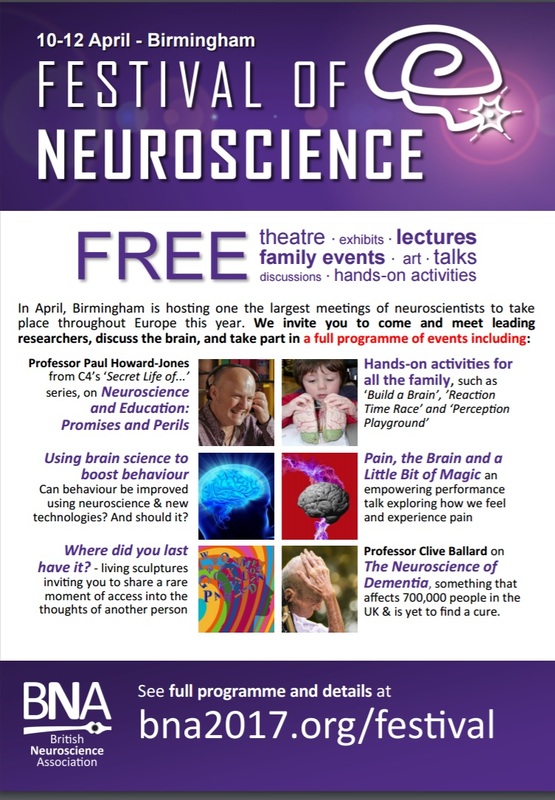 On Tuesday 11th April there will be a programme of talks and activities covering a variety of neuroscience and brain-related topics at the Birmingham Rep.
All talks are free to attend but you must book your place via Eventbrite. See below for details and how to book for each talk. The brain controls almost all of our behaviour. But how do we know this? And can we use this knowledge to improve our brain and our behaviour? Dr Nick Davis, from the Department of Psychology at Manchester Metropolitan University, will discuss how neuroscientists peer into the brain to understand how the brain is involved in the ways we act, the ways we sense our environment, and the ways we think, feel and imagine. 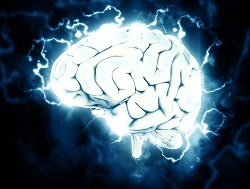 He will also show that exciting new technologies allow us to change to activity of the brain. These technologies can be used to improve brain disorders and help people to recover from stroke. But they may also be used to boost the functions of the brain, possibly giving people an advantage over their peers. What makes scientists think this is possible? And do we think it is fair to enhance brain function? Attempts to explain the roots of antisocial behaviour championed by criminologists and social psychologists have often focussed on environmental influences, personality traits and social learning theory. Recent advances in the field of neuroscience, however, have led to the emergence of a fresh perspective in which antisocial behaviours are linked to the functioning of specific brain circuits. This talk by Ian Mitchell from the University of Birmingham will focus on two such circuits, one of which appears to drive impulsive, emotional antisocial behaviour whereas the other is associated with instrumental, premeditated antisocial acts. The relative roles that these circuits play will be discussed in relation to serious offenders, including psychopaths, and in cases of low level antisocial behaviour. The potential for genetic and environmental factors to affect these two brain circuits and so impinge upon criminality will also be reviewed. UPDATE: with many apologies we have had to cancel this talk due to unexpected circumstances. We will post information here if we are able to arrange an alternative talk. 'Pain, the Brain and a Little Bit of Magic' is an empowering performance talk which takes a look inside the brain, exploring how we feel pain, how pain is signalled in the body and how we develop chronic conditions. Based on pioneering research, ‘Pain, the Brain and a Little Bit of Magic’ offers an optimistic message of how chronic pain may be better understood and treated. It is a performance designed for chronic pain sufferers and the people who support them, medical professionals and absolutely anybody who wants to know more about what makes the brain tick. Professor Anthony Jones is a leading neuro-rheumatology researcher at The University of Manchester. He pioneered the use of functional brain imaging to understand the brain mechanisms of chronic pain and is now using his discoveries to develop new therapies. This project is directed by Tyrrell Jones, produced by Molly Sharpe, includes a performance by Sam Redway, a brain model designed by Elisa Artesero, assisted by Tim Rainey (Lab Technician) and Javin Sandhu (Medical Student) and includes the speaker Val Derbyshire who is the Chair of the Salford Fibromyalgia Support Group. Public Discussion Forum: How do you cope with persistent pain? There are 28 million people in the UK are reported to be living with persistent pain. With no definitive cure available, people are encouraged to instead self-manage this long term condition. At this event a panel of people from local and national pain support groups (all who suffer from persistent pain themselves) and pain researchers will be waiting to respond to questions from the audience. What do you think of the 'Pain, the brain and a little bit of magic' event? Do opioids or other drugs help or hinder management of their pain? Is the health service effective in dealing with persistent pain? 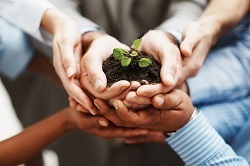 What is self-management and how does it help? How did people cope with pain in the past? Roald Dahl, the beloved creator of children’s novels and adult short stories, was fascinated with medicine, especially neuroscience, and had a lasting impact on it. 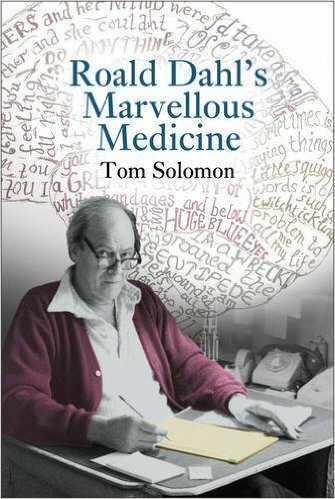 Join his doctor, Tom Solomon, who uses Roald’s stories to explain how the body works, what can go wrong and how we can fix it. Tom describes how Roald invented a medical device and new treatment still used today. You’ll also produce Gobblefunk and learn how to make your own marvellous medicine! Tom Solomon is now Professor of Neurology and Director of the Institute of Infection and Global Health at the University of Liverpool. He is also a leading science communicator, the Running Mad Professor, winning a Guinness World Record for creating the world's biggest brain. Tom will be signing his book, Roald Dahl’s Marvellous Medicine, after his talk. Performance lasts approximately 20 minutes. What would you do if you could return to a memory and change it? Would it affect your future? Could you rewrite a part of your own history? RECALL is a one-to-one live mediated performance which invites you to create a new memory and re-write a moment in your personal history based on your own desires and imaginations. In the field of neurology, scientists have identified that the human mind inserts information from the present into past memories. When recalled the memories become reinterpreted to adapt in an ever changing environment re-framing moments of a person’s life. Unlike a film which relays a recorded event as it was captured, the human memory edits information to present a story which fits into a person’s present reality. This interactive talk based on Stacey Bedwell’s book 'How does my Brain Work?’ provides an exciting introduction to neuroscience suitable for primary school aged children. Stacey and her co-presenter Isabelle will tell the story of an adventurous little girl as she discovers amazing things about what her brain is, what it looks like, how it works, and what it is made up of. This journey will lead young audiences through different areas of the brain and where they will discover the importance of neurons, and learn fascinating facts about brain biology. Forget elixir of life diets and age-denying miracle creams; in Galileo & the Art of Ageing Mindfully (Leaping Hare Press), Adam Ford turns his telescope towards the stars to reveal how a natural fusion of science and spirituality can offer us a reverential perspective on ageing. Contemplating the skies at night puts things into perspective, encouraging an inner stillness. One can then reflect, with greater strength and confidence, on the brevity of life – particularly when viewed against the cosmic backdrop revealed by Galileo’s telescope. The universe is almost unimaginably ancient; our lives are mere flickers of consciousness in comparison. Questions of deep time and existence are accompanied by a constellation of spiritual and meditative insights as Adam proves how our existential journey with ageing is the natural opportunity to experience the true benefits of mindfulness. Adam Ford is an ordained Anglican priest, now retired. He was formerly Priest-in-Ordinary to Her Majesty the Queen at the Chapel Royal, chaplain to a London school and vicar of a Yorkshire town. 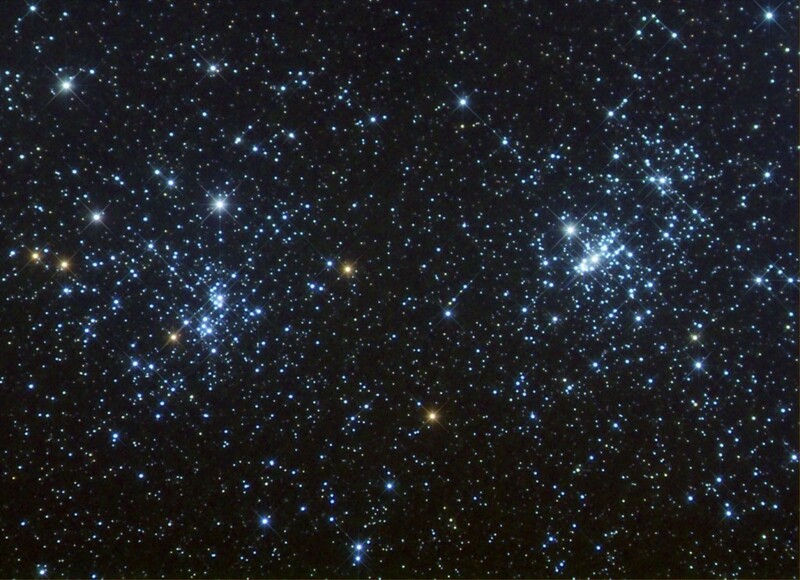 Now in his seventies, he first gazed up at the starry skies at the age of nine—and he has been captivated ever since. In Galileo & the Art of Ageing Mindfully he combines meditative insights with a positive perspective on ageing and understanding our place in the universe. This event is presented in association with the University of Birmingham Institute of Inflammation and Ageing, the Birmingham 1000 Elders Group, and by funds from the University of Birmingham Public Engagement Working Group. 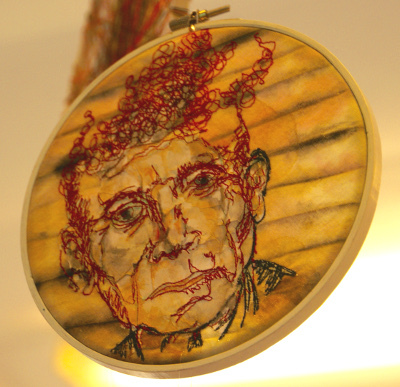 This programme of art commissions and drop-in workshop activity at the Library of Birmingham has been funded through The University of Birmingham and Arts Council England. Events and exhibitions will take place on 11th and 12th April and are FREE to all! This work is a series of living sculptures. Each has an audio line attached to them and earphones are nearby. Audience members are invited to pick up the loose headphones to listen in and in doing so have a rare and intimate moment of access into the thoughts of another person. This performance work is about loss, physical & emotional, and in this particular new working of the performance, about the loss of memory and of a losing a loved one to dementia. The content of this new performance was created through research and development with UK community members who are living with or affected by a family member who has dementia. It is supported by funding from ARUK and is a joint initiative between An Invisible Man and the Human Genetics Dept, School of Life Sciences at Nottingham University. A woman sits at a table. Next to her is a vacant chair. 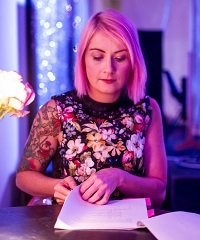 Participants are invited to join her and read through a script in the part of UNKNOWN PERSON. What is Socrates' phone number? begins with an understanding of how our brain works - how actions and memories of actions create the same neural pathways. When asked a question the brain can determine in advance whether there is any point searching the memory for that fact – or if it is pointless. IMAGE CREDIT: Photo by Jessie Leong. Homegrown, Home For Waifs And Strays artist development programme. A series of interactive activities will be held in the amphitheatre of the library to explore how our brain perceives the world. How well will your brain adapt if we distort your vision by 20 degrees? Will you be tricked by our optical illusions? Led by Andy Powell from Birmingham City University. Come a long to a drop in session where we will learn about neurones; why they have such a distinctive shape and how they use this to communicate with each other. Build your own neurone that will then be added to the network to create a giant “brain”, constructed in the library. Sarah has been commissioned to make a series of neuroscience-themed line drawings that will be available for distribution, along the lines of the current trends for "adult colouring-in” which promote mindfulness and could have benefits for mental health. Throughout the Festival there will be a range of activities and displays in the ICC Foyer and the Mall, the public walkway through the ground floor of the Birmingham International Conference Centre. All the activites are being run by neuroscientists. You will have the chance to speak with them about the research they are doing, and ask any questions the brain and nervous system - we will do our best to answer them! 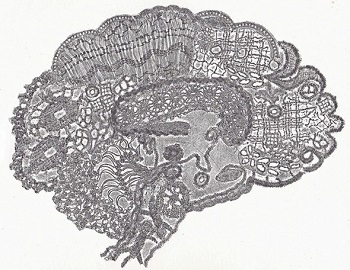 The artwork on display has been created by artists and art students in response to aspects of the brain and neuroscience research. 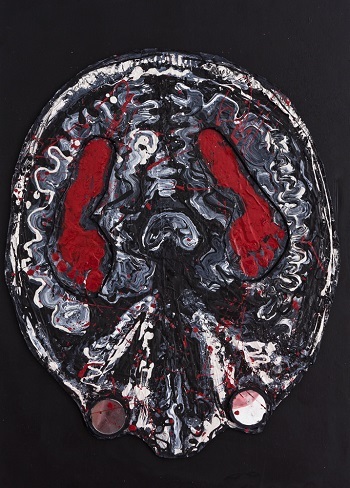 All in the Mind is a series of paintings in which Slade-trained artist, Rebecca Ivatts, has exploited brain imaging as a springboard for the imagination. With some initial guidance from a radiologist at Whipp’s Cross Hospital, London, Rebecca's highly textured, monochrome works are far from clinical but rather a playful celebration of the creative mind. 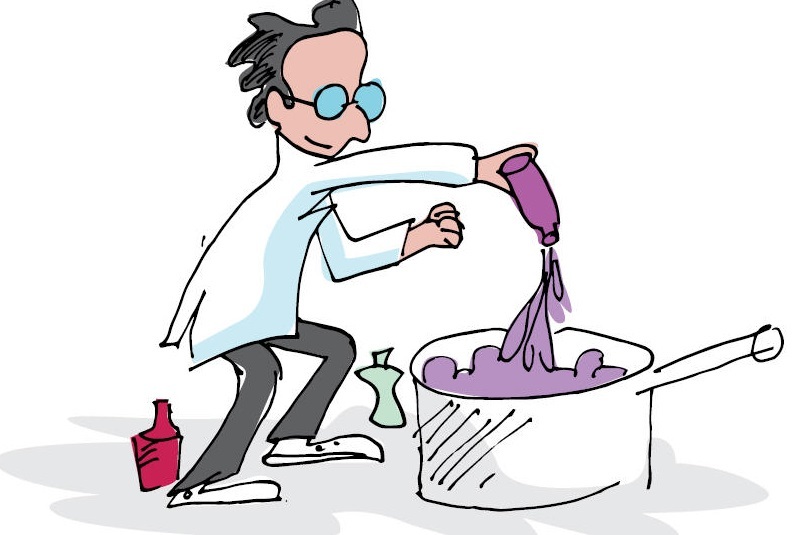 They also provide a rather tongue-in-cheek response to the way in which neuroscience has entered the popular domain: how it has become common currency for explaining our choices, foibles and innate capacity for good and bad. As the title, All in the Mind suggests, each work is open to interpretation. Each viewer will already have formed their own distinct neural pathways and associations which will in some way predetermine their response to these 'cerebral' images. Rebecca has specialised in classical draftsmanship of the human figure but more recently her artistic forays have taken her inside the body. 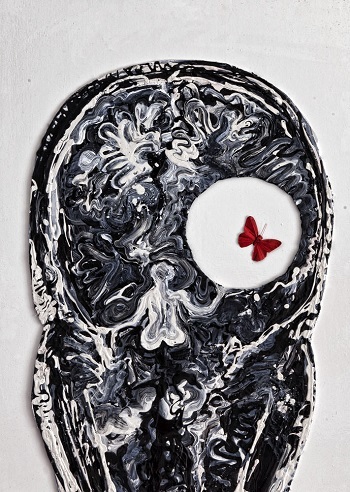 This transition was initially inspired by the otherworldly scans of her first child and, as the daughter of a biologist, her love of medical imagery. Symmetry is all around us in art, nature, buildings, and our own faces. We find symmetrical things more appealing to look at and this often shows when we create imagery like flags, signs or logos. We can identify symmetry very easily and automatically; this shows that the visual areas of our brains treat it as special. We use symmetry to help us make sense of what we see and to separate objects from the background. We will use a range of fun interactive games to discover what symmetry is, how to identify it, and how to make symmetrical patterns of your own. How long does it take you to react? Why happens during that time? How does age, illness, time of day or alcohol affect reaction times? Reaction times are an important indicator of processing in your nervous system. This interactive activity helps illustrate the many processes involved from when you see something to when your muscles react. We will record your reaction time using a digital machine. The results are displayed on a TopGear style leader board so you can see how you compare to your family and friends! You can take away your reaction time ruler so that the experimenting can continue at home. Your eyes are well suited to providing signals from which the brain can make sense of the world around you. What happens if you alter the signals from the eyes to brain? Can you still do simple tasks? Using special goggles to trick the brain by changing the information it receives, you will look at the ability of the brain to adapt to changes in what the brain ‘sees’ and ‘knows’. Can your brain adapt? How long does it take? This activity forms part of a wider ‘perception playground’ activity being held at the Library of Birmingham, led by Andy Powell from Birmingham City University. 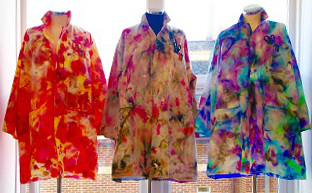 University of Southampton researchers and A-Level students from Peter Symonds Sixth Form College (Winchester) have teamed up to create a neuroscience-inspired artistic display. The aim of the exhibition is to reduce stigma and increase awareness and understanding of mental health and brain disorders. Researchers from the University of Southampton visited Peter Symonds College to provide insight into how their research is revealing the molecular underpinnings of neurodegenerative and psychiatric disorders. The students learnt about the different cells in the brain and how their function and morphology can change in disease. The aim was to inspire the students to depict/interpret a certain aspect of brain disorder/diseases, through the medium of textiles and art. 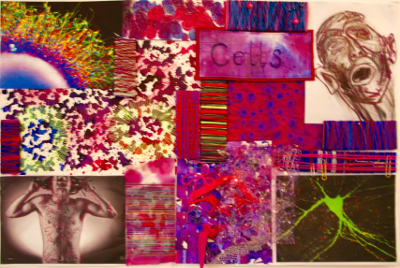 With the use of bright colours and words, the students' designs have portrayed their impressions of neurological condition, ranging from Alzheimer’s, Huntington’s disease and depression. This display, where ‘art meets the mind’, is a powerful and disarming medium to engage the public in discussions about mental health. This is a novel way to open science up to new audiences - those who thought that science was inaccessible to them as well as those who do not feel comfortable about discussing mental health issues. 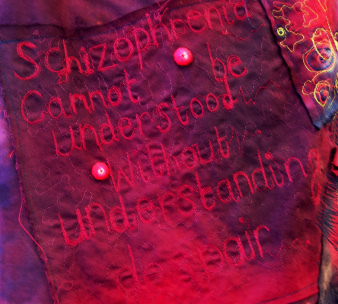 The display at the Birmingham ICC will include garments, depicting aspects of brain disorders and their effects, as well as posters and sketch books explaining the pieces of art. Several neuroscience-based craft activities and games will take place, including matching the brains, have a go on the “OWLS”, a reward-based game app, or at the magnetic dart context, make your pipe-cleaner neurons and draw your brain on swimming caps. Science will not be missed: Aston University will bring wet neuroscience to the table and explain how they record data from a neuron; the University of Birmingham will show you how to measure your own brain waves, and the Drosophila neuro team will guide you through the exciting research done with fruit flies.